Wreck-It Ralph is kind of a minor masterpiece. It is bright, wickedly funny, smart, and has a good heart. Even though it isn't a Pixar movie, it joins a long line of movies that anthropomorphize inhuman things and endow them with a life they really do not have: Toys, A Bug's Life, Monsters Inc., Cars, Wall-E. It also joins that line with being incredibly drenched in nostalgia. 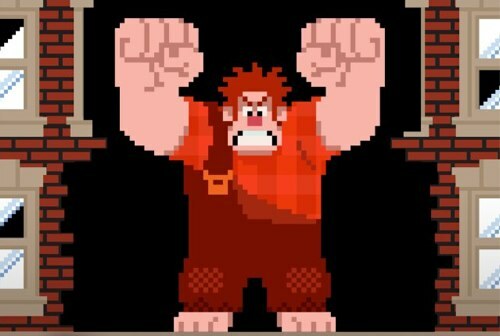 Wreck-It Ralph is about the lives of video game characters in an arcade after-hours. I really enjoyed the rules that this movie set up about how video game characters work. They can travel to each other's games via power cords (and the power strip amusingly serves as a central junction, kinda like a main train station). The world of the power cords and power strips is littered with characters from games who managed to abandon ship right before their games were permanently unplugged, and as such they have no homes to which they can return. The first time we go to the power strip we see Sonic give a funny PSA that lays out many of the ground rules for how these characters can function, the main one being that if you die when you're not in your own game you won't re-spawn. This made me wonder, though: would your code be deleted from the original console from which you came? Or when someone plunked in a quarter would a new version of you be generated from the code, like a clone with none of your memories or experiences? I would have loved for that one to have been answered! Anyhoo, the movie is about a big lug who feels put-upon by his lot in life and wants (a bit understandably) to be treated better. So he sets out on a single-minded (and a bit selfish) quest and of course grows as a person with his interactions with the characters he meets. Fine, fine, that's a pretty standard plot and all. But they ain't nuttin' wrong with the standards if'n they be done well, and this is done well. Ralph isn't a bad guy, but he is a bit muffin-headed. He's eager, so there is a lot of fun to be had with getting him in situations where he's in way over his head. He's also easily annoyed, so there is a lot of fun to be had with characters who figure out how to push his buttons. The supporting cast is very well-rounded and satisfyingly fleshed-out. The female lead from the sci-fi war game has an hilarious recurring joke where she was programmed with "the most tragic back-story of all time." Fix-it Felix Jr (the titular hero of the game where Ralph is the villain) is such an aw-shucks boy scout that it goes way beyond being annoying and swings all the way around to being unbelievably endearing. At one point he warns, "Pardon my French..." and then proceeds to say a string of things that are not even remotely profane (but are hilarious). And the plucky young Vanellope, who becomes a focal point of the movie, is voiced by none other than Sarah Silverman. What guts by Disney to put her (with her very non-family-friendly public image) in this movie! She manages to make a wise-guy tomboy girl be someone for whom you absolutely root 100% instead of an annoying stereotype. The standout, though, is the ruler of Vanellope's game, who is called King Candy. This is one of the best vocal performances I've heard in an animated movie in quite a long time, with all the inappropriate giggles and gurgles and weird inflections. I hope that you, like me, don't know who the voice actor is when you go see the movie, because then you can, like me, gasp in surprise when his name scrolls by on the ending credits. The story zips along, and the jokes are legitimately funny and mostly come right out of the situations and characters rather than being simple pop-culture references (though there are some of those, too). It is thoroughly enjoying, and each character gets his or her own little arc of meaningful growth and change. The movie is also full of fun gags for lovers of video games. There are dozens and dozens of cameos of characters from actual video games. Graffiti reading "Aerith lives" can be seen in the power strip. At one point the villain of the movie enters the Konami code in order to access secret information. There is an end-credit song by Jerry Buckner (of Buckner & Garcia, famous for the album "Pac-Man Fever"). And it goes on and on. I'm certain I could watch this movie a dozen times and still find more things. And I kind of want to. One thing I wish is that we got to explore even more video game environs. The movie takes place (with one gag exception) in only three total video games, with the majority of the story taking place in only one of them. I would have loved to have seen Ralph try to blunder his way through more, or maybe a climactic chase that went from game to game to game. Perhaps I will have to wait for the sequel? Speaking of sequel, there are some tantalizing possibilities for sequels to Wreck-It Ralph. After all, if video game characters can travel via power cords, what keeps them from staying in the arcade? And what would happen if these standup-based characters somehow got on the internet...? I find it kinda strange that 2012 is the year that Pixar put out a movie that is a pretty standard, middle-of-the-road princess story, and Disney put out a movie that was full of nostalgia and wit and humor and original ideas. Weird, huh?